At Family Fresh Market, we work hard to give you the quality, value, and selection you both want and deserve. That's why we're proud to offer Our Family brand products. With nearly 2,000 products located throughout the store, Our Family offers the widest variety of budget-friendly, national brand quality items — each backed by an unmatched Satisfaction Plus Guarantee so you can buy with confidence. 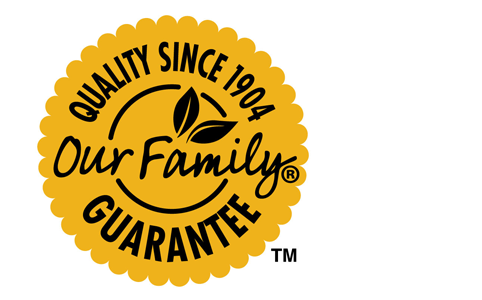 Our Family is already known for their commitment to quality, and now Our Family brand is taking it a step further with the Clean Ingredient Initiative. This initiative is committed to removing artificial ingredients from the products on your family’s table – without sacrificing the quality you demand! And like us, Our Family understands the value of giving back to the local community. Through their Direct Your Labels program, you can partner with Our Family to help raise funds for schools and other nonprofit organizations just by saving the UPC barcodes from your favorite Our Family products. Just clip, collect, and send. Helping your community has never been so easy! That unique commitment to community, quality, and value has made Our Family a trusted name since 1904. It's in everything they do, and it's in everything we do, too. Yesterday, today, and everyday, Our Family and Family Fresh Market are here for your family.